A heritage development project is proposed for the area presently known as the Pont Cassé Roundabout as part of the efforts to celebrate the Morne Trois Pitons World Heritage Site and to develop a heritage anchor for Dominica. The objectives of the project includes: implement a project using solar, water, wind and other natural resources for the beautification and enhancement of the Pont Cassé roundabout and immediate environs; establish a lighted fountain and monument incorporating Renewable Energy/Photo-voltaic Technology in collaboration with Rapha Centre in order to demonstrate and promote Commercial and Residential usage on a national level; celebrate Dominica's Morne Trois Pitons World Heritage Site as a national tourist resource as well as celebrate the plurality of the island's unique ethnic and cultural heritage – foremost Kalinago, African, European and Mulatto; create economic opportunities for development of activities in the immediate area for stakeholders of the surrounding rural communities including Pond Casse, Sylvania, Corona, Penrise and Belles; construct three bus shelters for persons traveling to the various points of the island in the first phase of the project. At a later stage, create a "rest stop" and parking area, a service point for tour guides and a "Market" where small-scale enterprises and vendors would display their goods and services to local travellers and visitors to the area. Aird said "two of the shelters were officially released into use during a brief commissioning ceremony held on Friday, January 31st and this was witnessed by a small group of local community stakeholders and project partners.
" A third shelter is still to be constructed for travellers headed towards the Melville Hall Airport, Marigot/Wesley direction as part of the second phase of the project, namely establishing a rest stop, visitor information kiosk, visitor parking, vendor stalls etc. The bus shelters are only a dimension of the development plans envisaged for the Pond Casse roundabout". The other objective include: re-name this important locale from its present name of Pont Cassé (Broken Bridge in French) to a name which more accurately and positively reflects upon the attributes of the area. 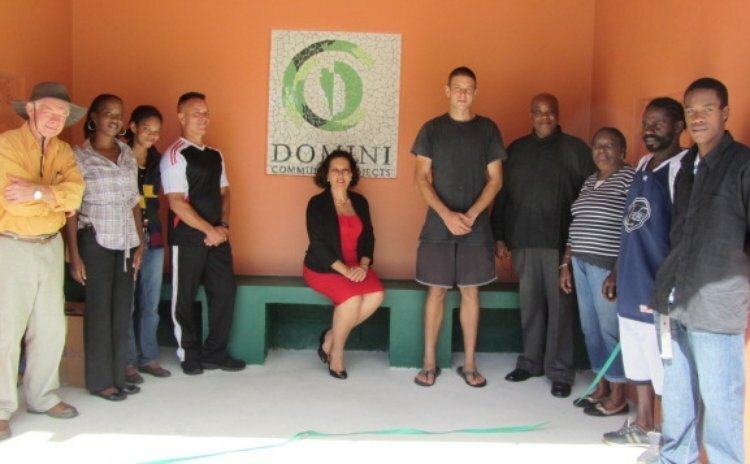 The project is be implemented by the Domini Corporation and Non- Government Organisation Domini Community Projects under the directorship of CEO Ambassador Jennifer Aird, accompanied by a Project Steering Committee which includes Dr. Alwin Bully and Sculptor and Engineer Roger Burnett.